This JAVA applet is a software implementation of the Vending Machine puzzle, a mechanical puzzle by Oskar van Deventer, see photo below. The object is to insert the indicated amount of coins. However, the machine seems haunted and keeps rejecting your coins. Can you persuade the machine to accept your coins? Insert coins until the vending machine is full of coins (all switches support one coin). Notice that you have an unlimited supply of coins. 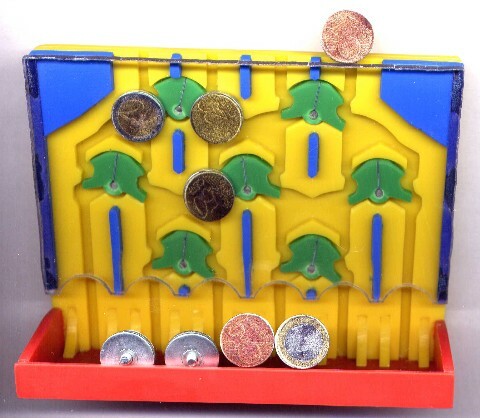 Here is a photo of the original mechanical Vending Machine puzzle, as designed and hand-crafted by Oskar.